# 2006 October One comment delicious . # 2006 October 3 comments delicious . i needed a laugh today. this was one. # 2006 October Zero comments No hashtags. # 2006 October Zero comments delicious . 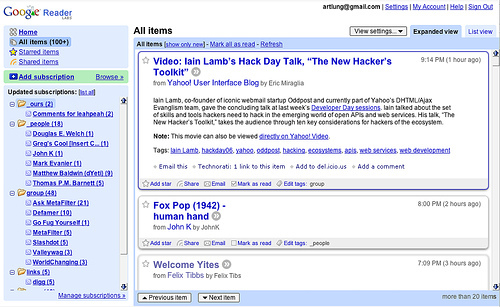 Holy cow but the new Google Reader is pretty darn good. Fully worth using to read your RSS and Atom feeds. # 2006 October One comment No hashtags. I used to really enjoy taping the radio, I still have some mix tapes with old radio (1980s) on them and they’re pretty fun. This one is evocative. That seems like a fun piece. Potentially strange and disorienting. nifty. try searhing for “artlung” or “joe crawford” to find stuff by me. Hey, I’m acknowledged in the README file for a bug I found. Nifty! activeCollab – open source project management and collaboration tool. supposedly a classic. and free! William Gibson‘s new novel will be called Spook Country. Not sure when it will be released, but there’s nothing on Amazon yet. # 2006 October 2 comments No hashtags. The opening song at Mass today, this evening, was Morning Has Broken, which I associate with Cat Stevens more than anyone else, though he did not write the song. It was a nice surprise. I remember my mother playing his record Teaser and the Firecat, and that’s a nice memory. Mass was packed, and ran long because of the blessings and words directed at this years’ Confirmation initiates. My own confirmation happened for me when I was in the 8th grade. These kids I think were high-schoolers, though as I age I find it a bit harder to nail down such distinctions easily. In looking at the page for Confirmation, I see that the custom of taking a confirmation name — I chose “Benedict” as mine, is just that, a local custom peculiar to English and German speaking. The Benedict I chose was Benedict of Nursia. I recall that I chose him because he was a kind of hermit. Read his biography and you see a lot about a life of study and isolation. It is a certainty I chose that as a person to model after because I felt myself so alone in the world. I had few friends by virtue of always being a new kid. The stretches of time afforded to a monk appealed to me. To draw and read and pray (in that order) were tremendously appealing. I was awkward and a little odd. I did my science project not on hurricanes or exploding volcanoes, but on the Pythagorean Theorem. I was cerebral and introverted. I wondered who these kids will choose for their Confirmation name. One aspect of the Mass was the family laying their hands on the initiates and blessing them. That’s something uncommon in the Catholic Church. In a LDS/Mormon Church, there are various Priesthoods held by the men of the congregation, indeed, my stepsons have what is called a Priesthood. True story, when my youngest got his latest Priesthood, an older Mormon male joked –mostly seriously — that you (getters of that particular priesthood, age 12) “have more of God’s power in your litte finger than ‘That Man’ in Rome does” — I glanced at Ty on that one. Ty is savvy and understands — even as a teen, that kind of a “cut.” It was a nice point of discussion to discuss how that fellow might be cutting himself off from certain truths, and offending his audience, by dismissing other faiths in that way. It was a great teachable moment for the whole family. I know I got a lot from it. I like something I read recently about something in the Baptist faith called “The Priesthood of all believers.” This sounds like truth to me. This is in keeping with the idea of a “personal relationship with God.” I think authorities can enhance that relationship, but in a vacuum, a disconnected person has that same agency, I believe. On other fronts, a cousin of the kids was killed in a motorcycle accident in the San Diego area last week. We had had them this weekend, but this short-circuited all that. I prayed for their Dad’s family, including them, at Mass. What else can one do? Hey, I don’t know anything. But I find the interfaith comparison thing fascinating. I’m learning every day. As Oso says too, Onward. # 2006 October 3 comments No hashtags. Now here’s some local history I didn’t know: Report Claims Simi Valley Nuclear Meltdown Has Been Causing Cancer For Decades. How wild. This is not actually that close to us, I mean relatively. But I’ll be watching the news. Here are two articles on ye olde Wikipedia: Santa Susana Field Laboratory; Rocketdyne Santa Susana Field Laboratory Contamination. Funny, on the radio yesterday NPR was talking about nuclear power. I think nuclear may be the way to go, but then I also think nuclear power requires such quality management that our own governments don’t have the capacity to manage nuclear power. A source of innocent merriment! Oso has a post you must read. Oso, God bless. 60 years down the road I’ll be 86 and Hector Enrique Calderon Contreras will be 83. Who knows what the Internet will be like at that point. Who knows if this blog will still be online and if it is, who knows how significant or insignificant it will be in the sea of searchable information. But maybe, just maybe, sometime in the next 60 years Hector Enrique Calderon Contreras will come across this post and he’ll remember the night he mugged a gringo tourist. Maybe that laptop he scored that night changed his life. Maybe he learned how to use a computer, was able to get a job, found himself inside the global economy. Or maybe he sold it for $500 and used the money to buy drugs. Maybe he kept stealing. Maybe he wound up in jail or dead. BarCamp LA has a posse blog. I missed the meeting last night. I’m just wiped out this week. 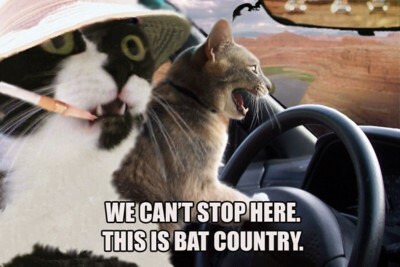 But I intend to go to the camp. # 2006 October Zero comments barcamp barcampla . Leah made that dress, in less than 24 hours. Based on a way-wrong “vintage” Vogue pattern and her own native skill. We’re still recovering the house from the party – we moved things around a bunch to get lots of floor space, but it’s all coming back around now with some hard work. Find out more over at leahpeah.com. Fo’ sho’. Hope to hear from you over there! Even when you mess up, you have not wrestled control from Him. After all the dust has settled, where you are and how you are is exactly as He had planned at the outset of creation. And so, there is always hope. Very useful. I actually used this in JScript for ASP — very nice. Welcome to Adult Children of Alcoholics – World Service Organization, Inc. I like that line. Read Joe the Potter. I read Lost Coyotes blog this morning and left my response. Today is the opening day of Utahs deer hunt. It is like a state holiday. I believe the kids get Monday off from school. Ill not go walking in the mountains today. Last night I could hear the boom of rifles being sighted in at the range east of town. I have fond memories of the pre-dawn excitment waiting with my father when it was still to dark to see or shoot. Those we great times. He is a very good shoot having distiguished himself during his army days in California. Neither of us care to hunt much anymore. It wasa mostly to put meat on the table but the memories are priceless. He always took me to very remote places where he had spent time as a boy and where most Utah hunters dont go. The time alone with him was good medcine. My mother can cook venison better than anyone I have met. fresh bread locally. I bet Leah might be into this place. Remember you are not the body. Neither are you the animal that pounds within the body, demanding its way in every thing. You are a G-dly soul. Do not confuse the pain and struggle of the body with the joy and purity of the G-dly soul. I hope to see this show eventually. # 2006 October Zero comments music passing-strange stew theater . Fast Windows: A faster Windows XP? Here’s how! Buy a Comic.Or heck, just send me money. I also have a lot of tech books I could sell you at a reasonable price. Consider this a garage sale. in 1999, i started this mailing list, and soon after the website at websandiego.org. since moving away 2 years ago, i have not been much of a steward of this list, and frankly have lost interest. i love and cherish this place, but i have moved on. i have appreciated so much those of you who have formally and informally made this list better. by moderating posts, by organizing events, by promoting the list, by just making the conversations great. not too much flaming, good talk, a good mailing list now, a great one in the past. so what to do? what is the proper way to transition it out of my hands, and into someone else’s? how can i do this while respecting the history of the list, and not incurring any costs on my own part. and i’m not even sure what all the issues are to think about. recently (read: yesterday) i sold the domain sandiegobloggers.com, that was a wake-up call for me, that these sites i have been facilitating might be worth something to someone. and frankly, right now i need money more than i need websites that i can’t adequately devote time to. i still have strong roots in san diego (still family and many friends there) but my interest and knowledge of what’s happening there has waned considerably. so, i guess what i’m asking is — how do i move it, what’s it worth (should i put the whole thing up on ebay? ), what conditions would you, the members put on a transition, and how do i do it in such a way that it does not get killed in the process? and here’s a toughie, just by bringing this up have i shaken some measure of confidence you have in this community. i’m open to all interested parties thoughts on this. public or not. email or phone or smoke signal. # 2006 October 3 comments sandiegobloggers.com . Forgiveness is the mental and/or spiritual process of ceasing to feel resentment or anger against another person for a perceived offence, difference or mistake, or ceasing to demand punishment or restitution. Forgiveness may be considered simply in terms of the feelings of the person who forgives, or in terms of the relationship between the forgiver and the person forgiven. In some contexts, it may be granted without any expectation of compensation, and without any response on the part of the offender (for example, one may forgive a person who is dead). In practical terms, it may be necessary for the offender to offer some form of apology or restitution, or even just ask for forgiveness, in order for the wronged person to believe they are able to forgive. Most world religions include teachings on the nature of forgiveness, and many of these teachings provide an underlying basis for the varying modern day theories and practices of forgiveness. Instances of teachings on forgiveness such as the parable of the Prodigal Son and Mahatma Gandhi’s forgiveness of his assassin as he lay dying, are well known instances of such teachings and practices of forgiveness. Some religious doctrines or philosophies place greater emphasis on the need for humans to find some sort of divine forgiveness for their own shortcomings, others place greater emphasis on the need for humans to practice forgiveness between one another, yet others make little or no distinction between human and/or divine forgiveness. but a poor man hears no threat. but he who gathers money little by little makes it grow. but a companion of fools suffers harm. the boys sometimes play with the names they give. leah too. funny stuff. Tefillin Hebrew: תפלין, also called phylacteries, are either of two boxes containing Biblical verses and black, leather straps attached to them which are used in rabbinic Jewish prayer. They are an essential part of morning prayer services, and are worn on a daily basis except the Sabbath and festivals by many Jews. In this article the term “to lay tefillin” will be used throughout but it is still correct to use “wear”. The Daily WTF – No Need to Change It! Funny COBOL story. True. True. stew sez, originally started back in 2003 for stew to vent some writing, has been given a facelift and new interface — it’s a blog. i’m proud to have been able to set this up for stew, and am looking forward to reading more and eventually seeing “passing strange” too. # 2006 October Zero comments blog music stew . really interesting thomas dolby song. The Joy of Tech presents Mac-O’Lanterns! bbc documentary on blade runner. why did this never get a dvd release with a special edition? kind of a shame. br deserves good treatment. 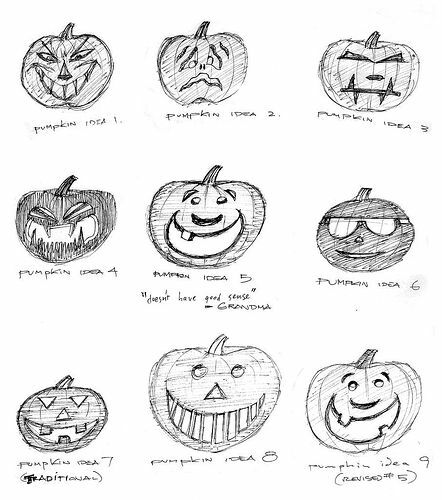 This is the time of year when traffic spikes with my post featuring my killer Halloween Pumpkin Designs from a billion years ago. Enjoy y’all!